Written by Kelsie Curry, '18 | Friday, April 20th, 2018 at 10:57 am. College Degree Research shares the following data on college students and the risk of suicide. 6% of undergraduates and 4% of graduate students have seriously considered attempting suicide in the past year. Almost half of each group did not tell anyone. 1.5 college students out of 100 have attempted suicide. You may hear these statistics about suicide and think to yourself that these statistics don’t actually apply to you or your social circles. You may think, “None of MY friends or family members would think about ending their own life.” Although you may think that this will never affect you, what if it does? Will you know how to respond? I am no exception to this. I had just come back to San Diego after spending a semester studying abroad and was filled with excitement to be reunited with friends and to return to our beautiful campus. During this exciting transition I quickly realized that a close friend of mine was struggling. I noticed her withdrawing from activities and showing several signs of someone who may be experiencing an internal crisis. Noticing or learning of a classmate, coworker, or loved one that is expressing signs of suicidal ideation can be scary. In this kind of situation, being aware of the warning signs and knowing how to appropriately respond in a supportive and understanding way can can play a powerful role in helping that individual get connected to the necessary resources. 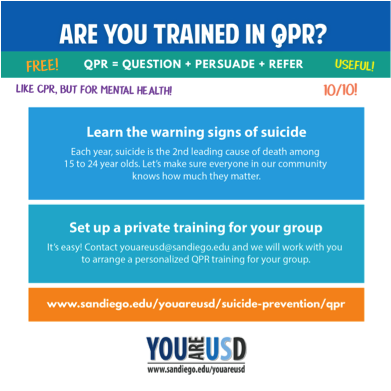 Fortunately, I took a training at USD called QPR Gatekeeper Training which made me feel more confident in confronting my friend about my concerns for her well being. QPR stands for question, persuade, and refer. These words represent the 3 important steps anyone can take to support someone experiencing suicidal ideation. Similar to the life-saving CPR training that we are frequently encouraged to learn, QPR is just as important of a life-saving skill to be trained in. Similar to how CPR acts as an emergency medical intervention, QPR can serve as an emergency mental health intervention. The purpose is for more people to be able to identify, intervene, and help direct individuals that may be considering to take their own life to the appropriate resources. This training is incredibly valuable for ALL campus community members to participate in. You never know when you will be confronted with these warning signs in your daily life and being QPR trained will help you feel more prepared to support an individual confronting these kinds of mental health concerns. In QPR training you get to practice how to have these difficult conversations and will walk away with a better understanding of how to connect people with the resources they need. Below I have highlighted the three components of QPR: Question, Persuade and Refer. It’s important to remember that asking the question of whether or not someone is having thoughts of taking their own life, does not increase the risk. If anything, it may even reduce the risk. It can be a helpful way to show someone that you notice them, are concerned, and most importantly that you care about their well-being. This step focuses on listening carefully and persuading the person to not follow through with any attempts. Using a sense of empathy and compassion helps create space for the person to feel understood and heard. The final step is to ensure we are connecting this individual with the best resources that will be able to most effectively support them during this difficult and often isolating time. 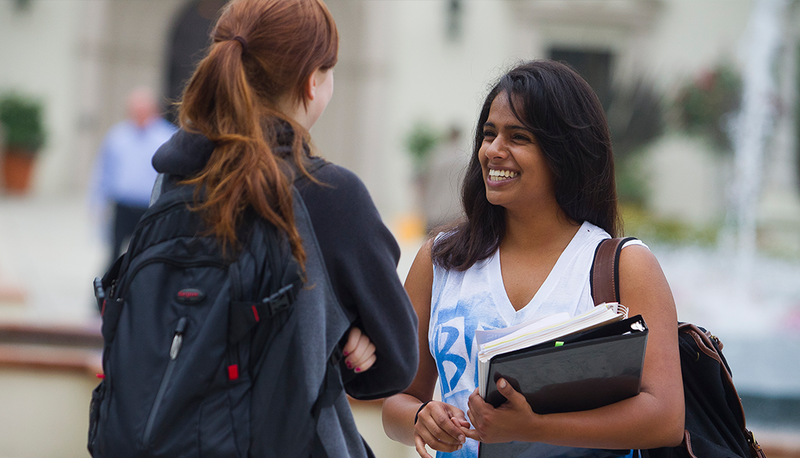 USD’s Counseling Center provides confidential resources and is open Monday – Friday from 8:30am-5pm, with extended hours until 6pm on Wednesday during fall and spring semesters. The easiest way to secure an initial consultation is by making a same-day or next-day appointment through your Wellness Portal. Students can also call (619) 260-4655 or come by the Counseling Center in Serra Hall, Room 300 to schedule an appointment. If the Counseling Center is closed and you need immediate assistance for an urgent matter, a counselor on call is available to support students for psychological emergencies at all times. The counselor on call can be reached by calling Public Safety at (619) 260-2222. Other 24/7 resources include the San Diego Access and Crisis Line (888) 724-7240 and the National Suicide Prevention Line (800) 273-8255, both of which offer crisis intervention, information and referrals. Join us for our last QPR Gatekeeper Training of the school year! This one hour training will provide you with skills and knowledge to better understand how to question, persuade, and refer someone who may be struggling and in need of additional support.